Russia is controlling homeless animal population by spreading poisonous chemicals and hiring firms with firearms to shoot all cats and dogs on the streets. Yes, this is a sad truth! Many citizens of all ages become witnesses of these horrifying tactics. Also some Russian citizens take it upon themselves to kill animals, especially young children who learn from their adults – also become very cruel towards animals. One of many examples of children torturing animals is about Timosha, a kitten thrown from the 8th floor of an apartment building by children (WARNING: GRAPHIC CONTENT!!! Video is included). There are so many similar cases with happy, but more often with very dramatic endings for animals all over Russia. The Russian government is not doing anything to better the situation of homeless animals. The government decided to simply launch a murdering campaign of animals on the streets and, hence, making it “legal” to rid of homeless animals this way!!! In this picture below is one of the homeless dogs that was poisoned recently in Sterlitamak. On the video, you can see another dog who also consumed the same poison (it happened in the same location) and dying the same way as the one in the picture. The black dog in the picture also died that day. Homeless animals are not the only ones suffering – people who take their pooches for a walk also find their dogs and cats foaming at their mouths, trembling from convolutions and suffocation, and then dying within 30 minutes after they accidentally have consumed a poison from the ground on the streets. And this is happening every single day! A group of animal right activists and volunteers started a petition addressed to the major of the city Sterlitamak asking to stop the killings and create alternative humane methods to control the population of homeless animals. We hope that you can join us and sign this petition. This petition is for people to see what is happening in Russia. Gulnaz Rahmatullina is the creator of this Petition and one of the animal rights activists of Pravo na Zhizn (“Right to Live”, Sterlitamak, Russia). 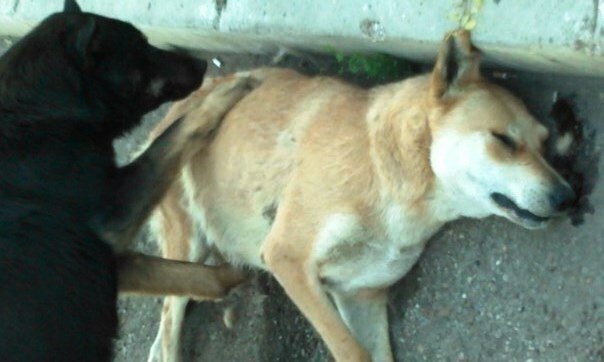 Stop inhumane methods of animal population control in Sterlitamak, Russia. This is a plea to seize inhumane methods of animal population control in Sterlitamak. Mass murder of homeless animals is taking place in our city. The methods of homeless animal population control are cruel and inhumane. Not only are dogs shot to death but also poisoned by chemicals easily available to the population at any drug store. Cats are killed in the same inhumane manner. These chemicals (poison) cause tremendous suffering to the animals: choking, seizures, foaming at the mouth and agony for 30 minutes! The poison is spread in public places such as schools, where children see these animals dying in agony right in front of them causing these children psychological trauma! We, the mothers and children, are against animal cruelty! We, the citizens of Sterlitamak, think that controlling population of homeless animals using cruelty is inhumane and economically ineffective. By killing animals the population of homeless animals is not decreasing, it actually increases filling out the void created in nature (according to the specialists-veterinarians). Moreover, there is nothing humane and moral using these methods. 3. Create and implement social and educational campaigns for the people, especially children in schools, about ethical treatment of nature and animals via humanitarian ads, banners, flyers, television, newspapers and other types of media. The purpose of such campaigns will be to inform people about how important it is to sterilize their animals and will teach people that they are responsible for their pets. These methods have already been used in many cities in Russia, throughout entire Europe, in some Latin American Countries and even in some African countries. We are hopeful that our plea to Izotov Aleksey Nikolaevich, the mayor of Sterlitamak will be heard and our Golden City, as they call it, will start using humane methods to control the population of homeless animals. Pravo na Zhizn (“Right to Live”, Sterlitamak, Russia), the animal activists group has organized many demonstrations in their city to protest the “legal” cruelty against animals, but, unfortunately, their manpower is scarce because fear of people with power prevails. We have already reached almost a half of 5000 needed signatures. We need your help! Please spread this petition and sign it! Leave a comment of support for the animal rights activists in Russia!